If there's one downside of a Brian K. Vaughan book is that a 22-page monthly isn't enough. I need to know what happens next just as soon as I close the latest issue. This is, I suppose, a testatment to Vaughan's ability to give the reader just enough of plot development where sometime happens, changing the course of the story, then leading the characters in another precarious situation. Such is the case with 'Paper Girls' #4 where we find our heroines being escorted from danger with the help of a couple gruesome-looking alien teens in hopes to save Erin from her injuries. If only it were all so simple. Heck and Naldo have a plan that the girls aren't too convinced but with Erin's life hanging in the balance they have few alternatives. Unfortunately, their escape through the sewers leads into some more danger. Vaughan is playing the long game and dropping some plot points along the way like feed to a chick. We're just pecking around picking up what Vaughan is putting down. The girls are bound together by this horrific end-of-world situation and so they have to stick up for one another and they do. The alien teens mean well but what are they really up to? Meanwhile, Cliff Chiang continues to take us back to 1988 with fashions and nostalgia from video games to band t-shirts. His designs are so fluid and seemingly effortless that everything is just seducing my eyeballs. The lines are dense and urgent conveying tension and anxiety. The Tiffany flashback and the monster design are the most dynamic scenes of the issue that skew from what we've learned to expect from the series. Matt Wilson finds a unique palette for the flashback and then surprises us with the splash of color for the bulbus monster. 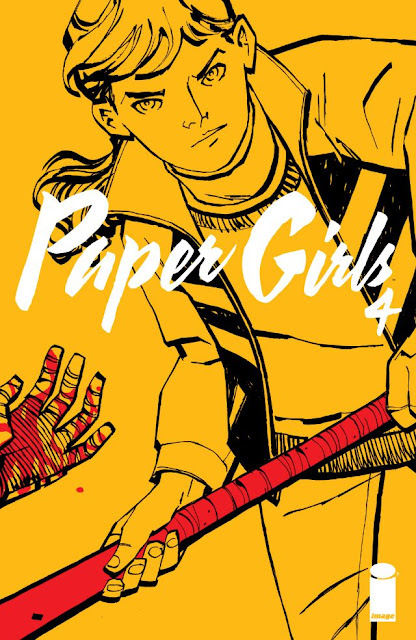 It's enough of a change to keep us off-kilter as the paper girls adventure continues. 'Paper Girls' #3 is moving fast with something dramatic happening with every issue. At each turn the stakes get higher and higher and before you know it the issue is over leaving you outraged that you have to wait another thirty days to get more. Vaughan has created literary crack as he so often does with Chang and Wilson as his accomplices. There's no way to avoid getting addicted to this weird 80's-inspired kids-in-peril sci-fi adventure.